We mourn the loss of our longtime friend, Patsy Batchelder. 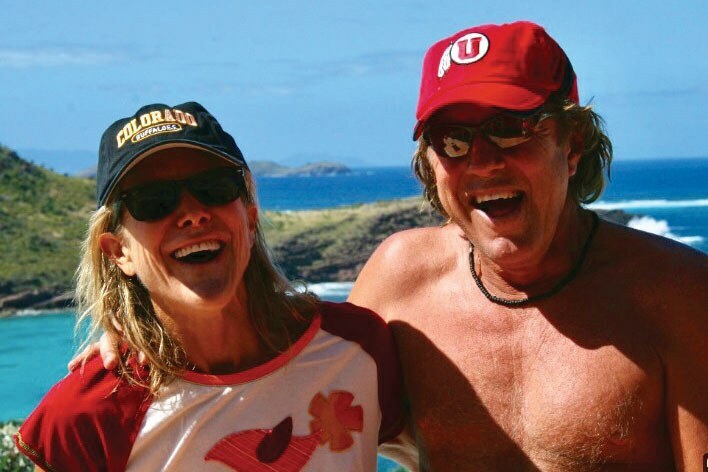 Patsy Batchelder and Andy Wiessner at St. Barts in the Caribbean. We mourn her passing. Is it spring yet? Winter has been great, but some of us are already looking forward to warmer, longer days here in Gunnison, Colorado, where High Country News has an editorial satellite office. Luckily, Assistant Editor Anna Smith, who is based in Portland, Oregon, flew out for a visit and brightened up our lives. She managed to attend to some important business too, leading a training session for newer editorial staff members together with Associate Editor Tristan Ahtone, who heads HCN’s Tribal Affairs desk. We also welcomed another visitor to our Gunnison office, longtime reader Chris Mochulsky, who was first introduced to HCN back in law school and said he’s especially excited to see our expanded tribal affairs coverage. Meanwhile, our dispersed editorial staff has been busy, meeting with readers and speaking to students in classrooms around the West. Associate Editor Kate Schimel video conferenced from Seattle to discuss her most recent feature, “What Killed Washington’s Carbon Tax?” with graduate students studying environmental management at Western Colorado University. Contributing Editor Carl Segerstrom was invited to appear on For Lands Sake, a radio program produced in Carbondale, Colorado, where the conversation bounced from the new nominee for Interior secretary to sage grouse and the impacts of the federal shutdown — and more. As Carl put it: “We covered some ground.” And out in Elko, Nevada, HCN Correspondent Tay Wiles participated in panel discussions about the state of rural journalism in the American West during the annual National Cowboy Poetry Gathering. Contributing Editor Cally Carswell, who is based in Santa Fe, New Mexico, started a new podcast called Hot and Dry, co-hosted by fire ecologist Collin Haffey. It covers the impacts of climate change on New Mexico and offers some thoughts about how we need to respond. The first season will focus on how the state’s new governor and Legislature are planning to tackle major climate issues. Finally, we have some sad news to share. Patsy Batchelder, wife of longtime HCN board member Andy Wiessner, passed away peacefully at home in Old Snowmass, Colorado, on Feb. 9, with Andy and his daughter, Mia, at her side. Patsy was a fixture at HCN board meetings and hosted several events for HCN in Old Snowmass as well as in Vail. A lively outdoorswoman and enthusiastic dog-lover, armed with a radiant smile and boundless energy, she fought for the environment and nature throughout her life. We will miss her.